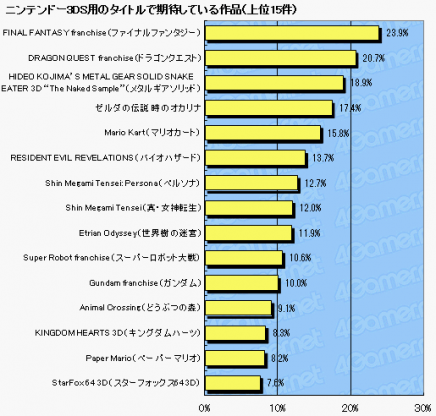 In a poll conducted recently by the Japanese website 4gamer.net, the results reveal that Ocarina of Time 3DS, a title being released for Nintendo’s upcoming 3DS console, is the fourth most anticipated game for said console. Zelda lost to franchises such as Final Fantasy (in first place) and Metal Gear Solid (in third place), but came ahead of franchises like Paper Mario (in 14th place) and Animal Crossing (in 12th place). Apparently, the results of this poll “aren’t too shocking” and would appear to be the norm for Japanese gamers. However, being American and not too aware of Japanese gaming trends, I wouldn’t be able to tell you whether this was true or not. The results of the poll can be viewed below. The only title without an English translation is Zelda. What are your thoughts on these results? Do you think they also reflect the tastes of gamers from the western world? Does the anticipation factor for each title related to the popularity of its franchise? To me, the answer to the last question seems a bit obvious (yes), but there are some other variables to consider. For example, if the first Zelda title for the 3DS was going to be an original game as opposed to a remake, perhaps it would be higher up on the poll. What do you think about that? Tell me your answers to those questions and any other thoughts you may have in the comments!